I had the opportunity to stop in at two interior design shoppes in the Myrtle Beach area. Posh Living & HAI Homes...as soon as I stepped in at both of these places my heart swelled with happiness! The colors, the chunky furniture, the light weight fabrics, the glass, and seashells...Oh My!! These two shoppes are not just decorative accessory stores, these are full service interior design firms and I realized by visiting that my style is 100% coastal. For years I have gone back and forth between cottage and traditional decorating styles. Traditional because it is safe and clean, like Pottery Barn. I also think I choose traditional because we don't live at the beach and it doesn't seem to fit. I don't like trendy beach stuff like flip flops, and super bright colors I like the neutrals of shells and sand, the blue greens of the ocean, the dark woods of the tropics, the bright pops of color in the flowers. This was a dresser at HAI Home, love the weathered look and the whimsy of buttons nailed in to make the design. 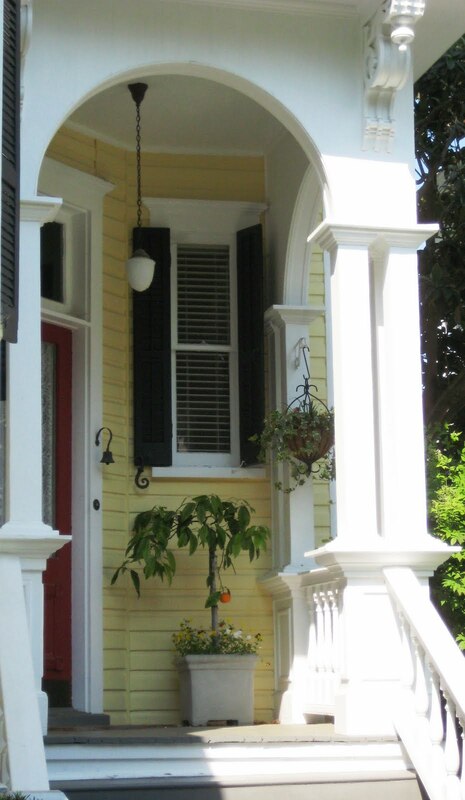 I will leave you with this pretty porch in Charleston. Love the old light and the pretty colors. That's a very cool dresser. I have never seen anything like that. Thanks for sharing at my Swing into Spring party. I only wish I had made it...but it is a great idea and I am keeping it in my idea box for a dresser one day. The buttons were actually nailed in with tiny pins.